We are definitely moving. We're closing on the land in early March, and construction will start on the house (hopefully) by May. Life is going to be very hectic for a while. Jeannie is, of course, oblivious to all of the plans. 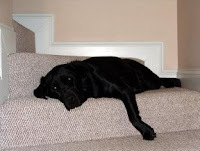 We wonder if she'll miss her favorite place to lounge--on the stairs leading from the living room. She always lies on the same step, and her favorite position seems to be this one. Will she miss it, Julie has asked me. No, dogs seem to adapt a lot easier than people do. I think she'll be so excited to have a new place to explore and she'll be ready to move on--perhaps we should follow her lead.